(Newser) – A fisherman who says he spent 13 months drifting across the Pacific Ocean finally made it home to El Salvador last night and was overwhelmed by the welcome. 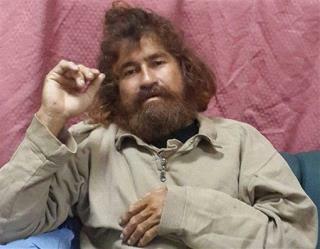 Jose Salvador Alvarenga was met by family members, government officials, and dozens of journalists. He attempted to address the media but was speechless and appeared to cry, the AP reports. "We ask for your understanding. He’s had a very exhausting trip," the country's foreign minister said. For someone deprived of a normal diet for 13 months he looks in amazing good health.